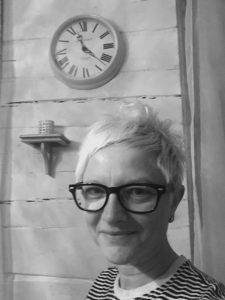 Rita is a Hungarian-Canadian writer, playwright, multidisciplinary performance creator, actor, a retired professional dancer and a Somatic Relational trauma-informed Consultant with a Calgary based private practice. With her husband Ken Cameron, she is co-artistic director of Productive Obsession, a multi-disciplinary performance company. She is an Alumna of The Humber School for Writers and a graduate of the National Ballet School of Canada. From 2014 – 2016 she mentored under novelist Dennis Bock and in 2018, under acclaimed editor Adrienne Kerr. Rita’s fiction and creative non-fiction has been published in The New Quarterly, FFWD Weekly, Unlikely 2.0, WritingRaw.com, Pages of Stories, and THIS Magazine. THIS awarded her 3 rd Prize in their Great Canadian Literary Hunt in 2012. In 2010, her travel stories were aired on CBC Radio Calgary’s, The Homestretch for eight months. From 2010 – 2014 she produced an annual event at the Central Memorial Library called Literary Vaudeville-Loud in the Library. She is a member of the Writer’s Guild of Alberta. Her hit play 52 Pick Up, co-written with TJ Dawe, has been produced by over 20 theatre companies and performed in Canada, United States, England, Australia, New Zealand, Australia, Iceland and France. In 2012 it was translated into Icelandic and into French in 2013. 52 Pick Up won the Chapters’ Best Text Award at the Montreal Fringe in 2000. In 1999 she was co-writer and performer of Ingenious Speculations at the Belfry Theatre with Roy Surette, Kim Selody and Jan Derbyshire. In collaboration with David Bloom and David Rhymer, Rita co- created, choreographed and performed in Trouser Parts in 1998 (Jesse Richardson Award nomination for outstanding direction). With Dmitry Chepovetsky, Rita co-wrote and starred in Bloodline (nominated for a Jesse Richardson Award for best new play in 1997). In the past thirty-six years she has performed in Canada, the United States, Germany, Hungary and Iceland and Estonia. In 2018, her one-woman show My Fair Lady-The Punk Version played to four sold out shows in the studio at Theatre Junction Grand. In 2014 and 2015, her show The Damage is Done co-starring Dr. Gabor Maté performed to eight sold out shows at The Banff Centre for the Arts and at The Cultch in Vancouver, and toured to the Yukon Arts Centre. In March 2013 she performed her one-woman evening A Night of Literary Performance Adventures in Iceland for which she received critical acclaim. 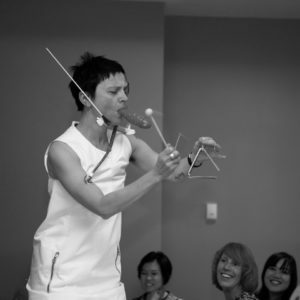 With the assistance of a Calgary 2012 Project Grant and a Banff Centre arts residency, Rita wrote, co-directed and performed in Be A Man – A Performance Adventure. Rita has worked with One Yellow Rabbit Performance Theatre and appeared in Featherland, Doing Leonard Cohen and Dream Machine. Her television credits include X-Files, The Adams’ Family, Cold Squad, Chris Isaac Show and Tom Stone. Film credits include Lies My Mother Told Me, Chasing Freedom, Word of Honor and A Problem With Fear. Rita’s early career focused on dance. From 1988 – 2000 Rita performed as a dancer in Toronto, Winnipeg and Vancouver. During her career she danced with the National Ballet of Canada, Royal Winnipeg Ballet, Jumpstart, Lola Dance, Judith Marcuse Projects, Karen Jamieson Dance, Dancecorps and Mascall Dance. She was noted for her roles in both Berlin Angels and Four Fridas, created by Lee Eisler. After seven years, she has completed her first novel, When I Was Better.